There is so much potential in an acorn. It could become a giant oak tree, or a snack for a squirrel. This tile looks great alongside the 4"x4" oak leaf and 4"x4" oak tree tiles. The acorn design is also available in the two inch by two inch size. Tiles are approximately one half inch thick, except where the raised design appears. Those areas will be slightly thicker. Choose from several glazes; all are non-toxic and dinnerware safe. 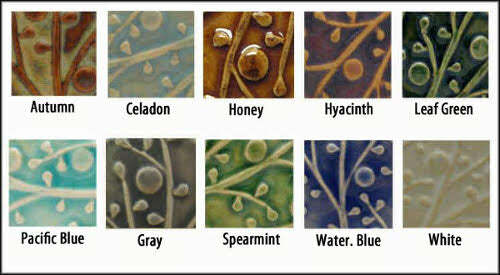 This acorn handmade tile can be easily hung on the wall, or used in a permanent installation. Emu Tiles are inspired by nature, and made to order from a durable stoneware which is fired once to 1800F, then glazed and fired again to 2200F.